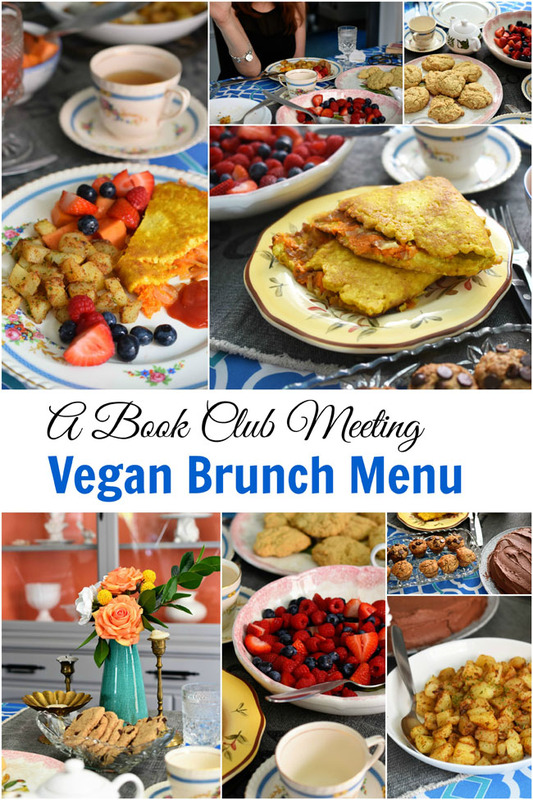 In case any of you still think vegan food is boring, I wanted to give you a peek at a recent book club brunch that I hosted. Our book club group is very small. Like just three of us to be exact. But we like it that way. 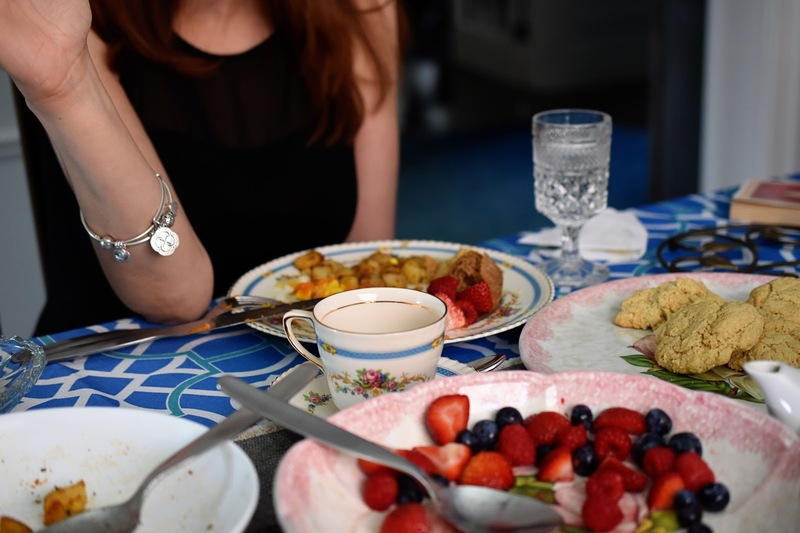 Because our book club meetings are all about the food and we are all on the same page when it comes to the menu. My two pals are not vegans, but they enjoy eating vegan food. And my sister-in-law doesn't eat dairy or regular wheat. 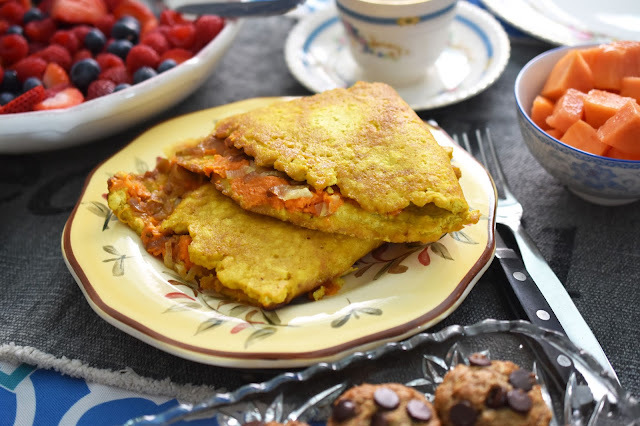 We are all comfortable cooking and baking items for a menu that's vegan and free of wheat. (We use spelt flour for our baked goods. Please note, spelt does contain gluten.) 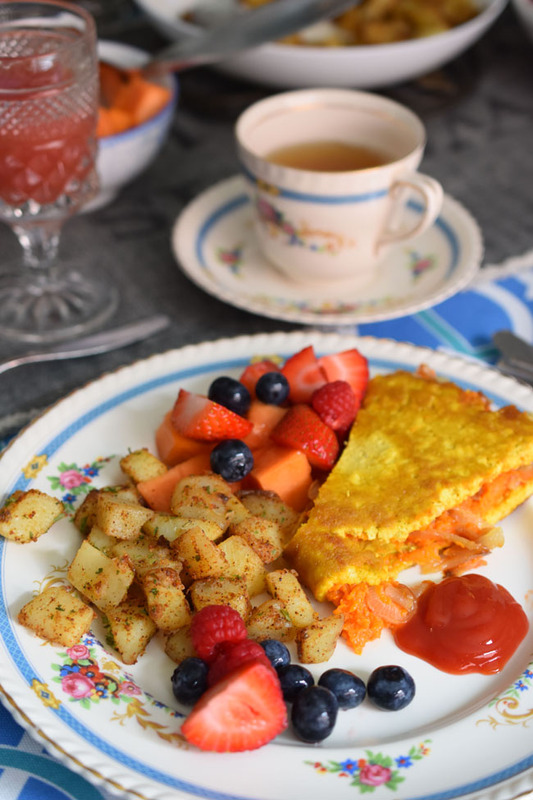 Sarah made our main entree, this gorgeous tofu omelette, filled with sweet potato and caramelized onions. It was delish! I snagged leftovers to have for breakfast the next day. Sooo good. 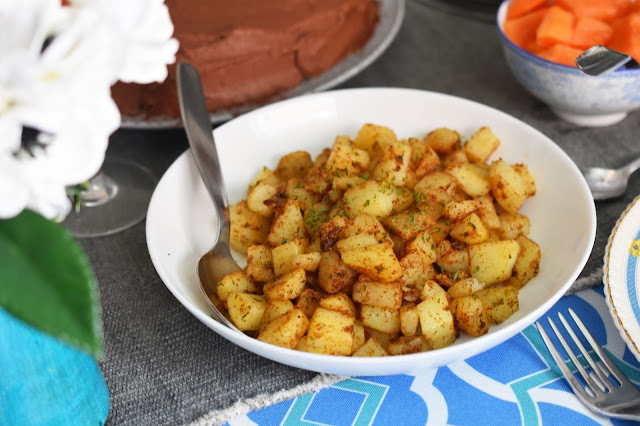 For our meetings, I have a tradition of making fried breakfast potatoes with spices and dried parsley. They feel a bit decadent, befitting a special day. Connie made this beautiful fruit salad of organic strawberries, raspberries and blueberries. 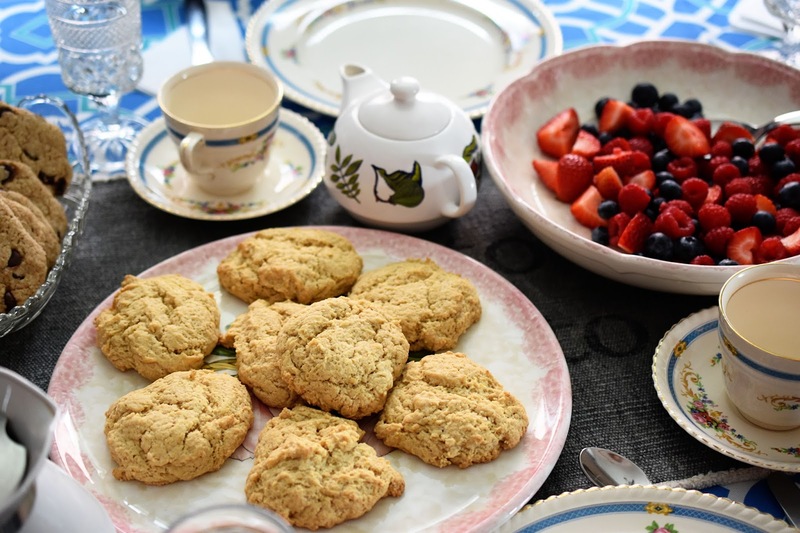 She also made English scones, because there must be scones at a brunch. These ones were buttery and delicious, without the butter. My daughter came home during our meeting and had one. And then she had another. I put one aside for later and soon found that gone too. An argument ensued. I don't have a recipe for these particular scones, but I really like these Scottish Scones. My daughter had baked chocolate chip cookies the day before so I put out a few of those too. 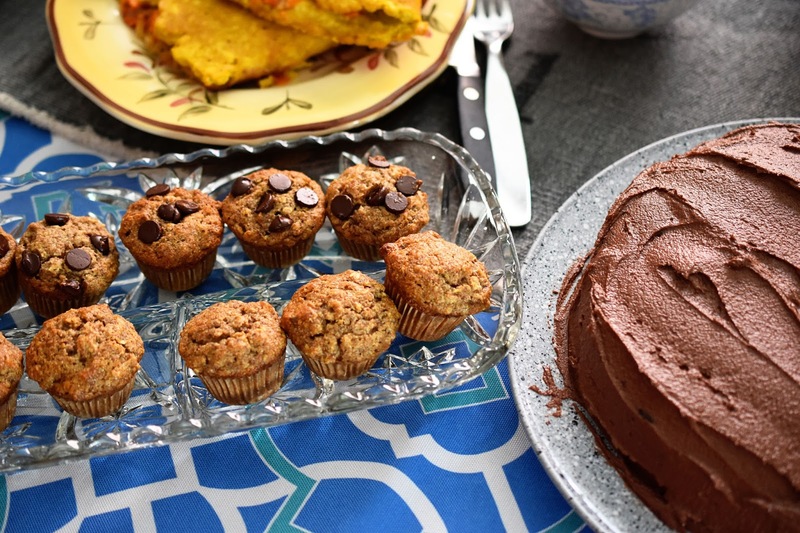 I love all kinds of muffins, but I make these vegan banana chocolate chip muffins most often. I made them in miniature size for our book club meeting because I figured with all the other food we wouldn't want to eat huge muffins. Sarah made a delicious vegan chocolate cake with chocolate icing for dessert. 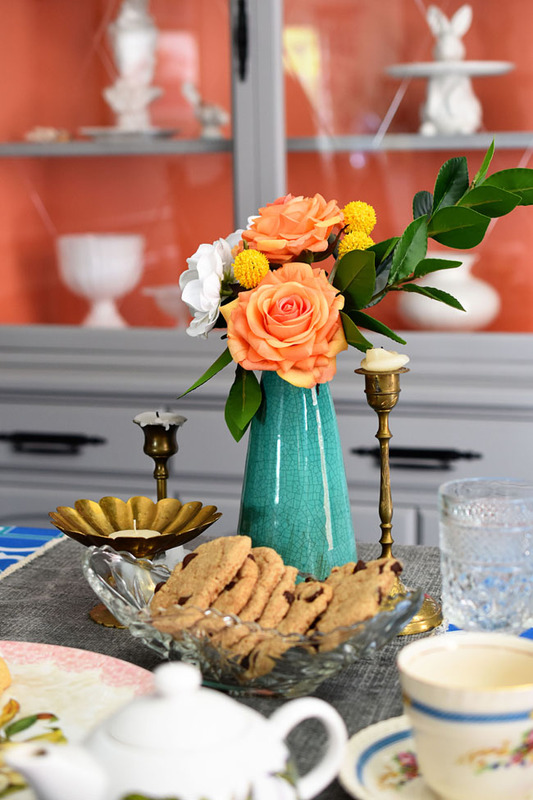 Because you know we needed dessert! We were very content with our vegan brunch menu. Like sit-and-eat-way-too-much content. We hope to meet again much sooner this time. We might even read a book first. Do you belong to a book club? Is it a wine and cheese sort of affair or a brunch-appropriate daytime event? 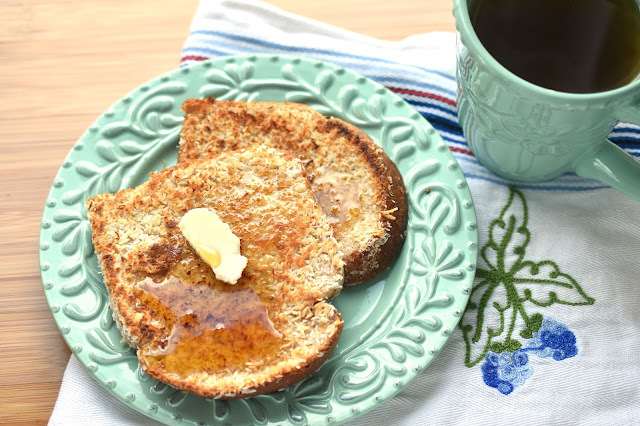 Now here's a look at a day of vegan eats, starting with this breakfast of coconut French toast with maple syrup. The recipe is from Isa Does It: Amazingly Easy, Wildly Delicious Vegan Recipes for Every Day of the Week , a book that I highly recommend and use regularly. For lunch, we had Buddha Bowls from a recipe in the Oh She Glows app. 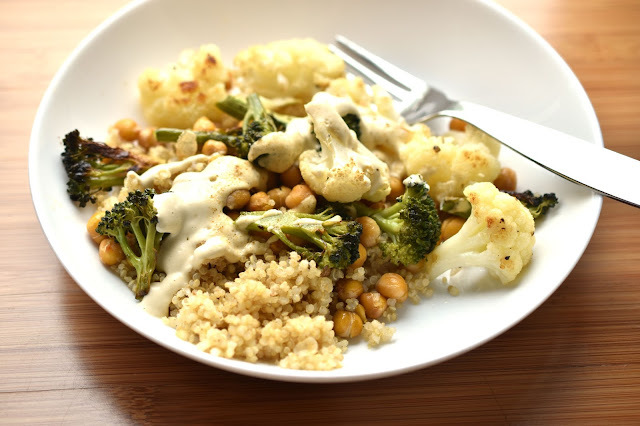 It involves roasting a whole head of cauliflower and a head of broccoli, plus a can of chickpeas. There's a lovely cashew-based sauce and we served it all over quinoa. A simple but tasty meal. For dinner, we did homemade pizzas. 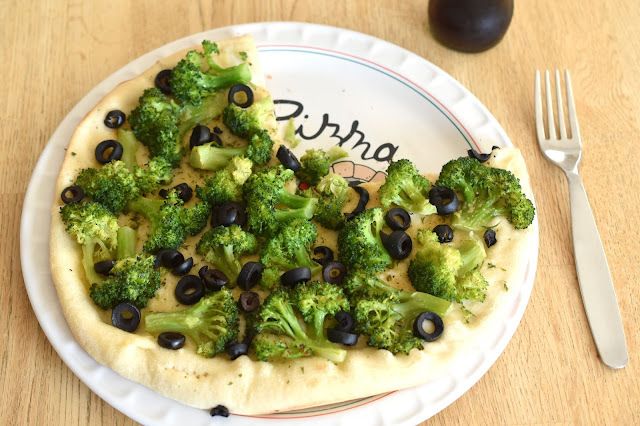 Mine was covered in black olives and broccoli (which we had previously steamed with olive oil and garlic). All in all, a good day of vegan eats. What do you like on your pizza? 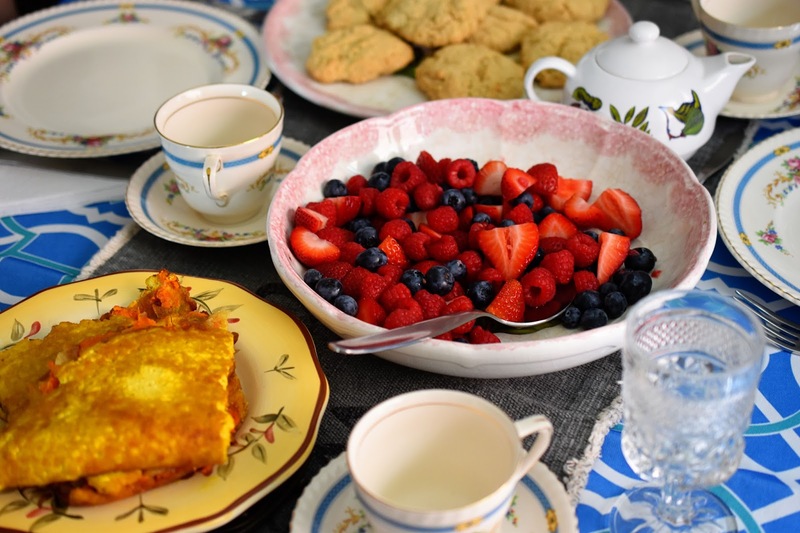 What have you been eating and enjoying lately? Looks lovely, filling, and healthy. The tofu omelette had me fooled at first. Looks like a regular omelette.